We should devote our lives to others. 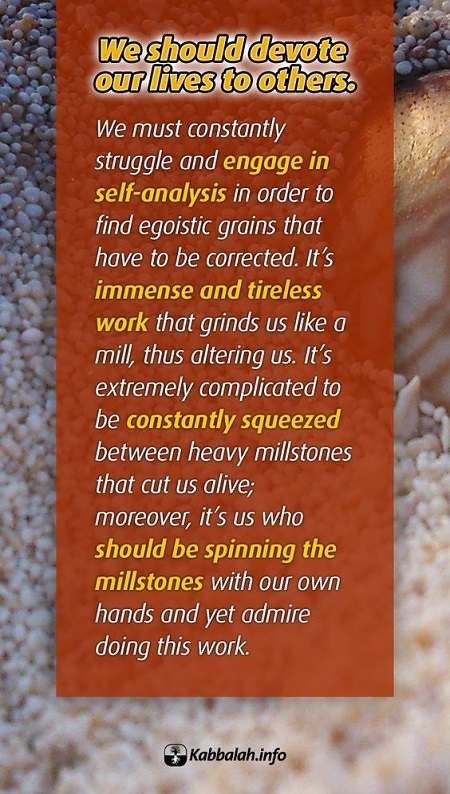 We must constantly struggle and engage in self-analysis in order to find egoistic grains that have to be corrected. It’s immense and tireless work that grinds us like a mill, thus altering us. It’s extremely complicated to be constantly squeezed between heavy millstones that cut us alive; moreover, it’s us who should be spinning the millstones with our own hands and yet admire doing this work. This is a real breakdown for my egoism. I act in relation to the friends, and the friends act in relation to me. I correct myself by means of correcting them. No one does this without others, and he depends on others in all his actions in the positive and negative sense, in joy and sorrow. He depends on their good and bad actions, and they depend on his good and bad actions. This is what the mutual guarantee is. Wishing good for ourselves, our nation, our country, I must take care of everybody. Only then will it be good for me. 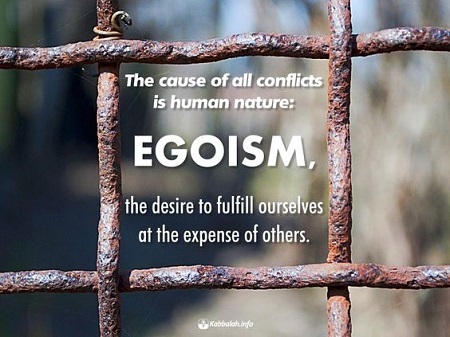 The cause of all conflicts is human nature: egoism, the desire to fulfill ourselves at the expense of others. Human egoism is the only destructive force that exists; hence, the world will not be able to persist unless we change our egoistic approach to society. Egoism of a part leads to the death of the whole. 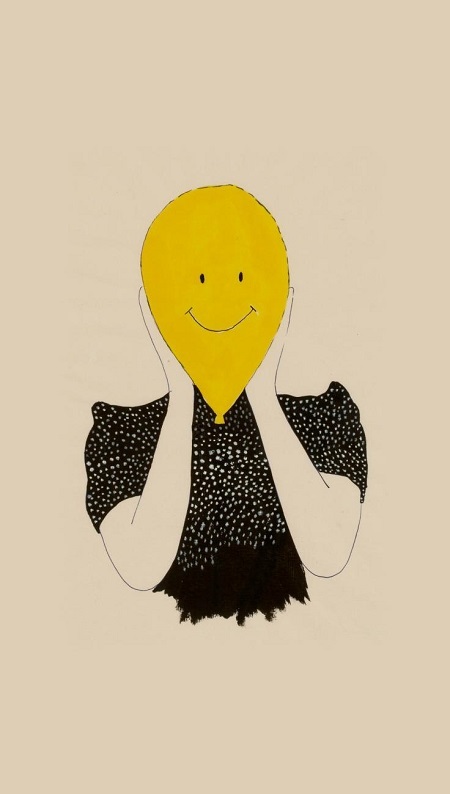 If a cell in a living organism begins to relate egoistically to other cells it becomes cancerous. Such a cell begins to consume surrounding cells, oblivious to them or to the needs of the whole organism, and thus, eventually extinguishes the entire body, including itself. The same applies to human egoism with respect to nature: while developing for itself, detached from the rest of nature and not as an integral part of nature, the egoism leads everything to death, including itself. 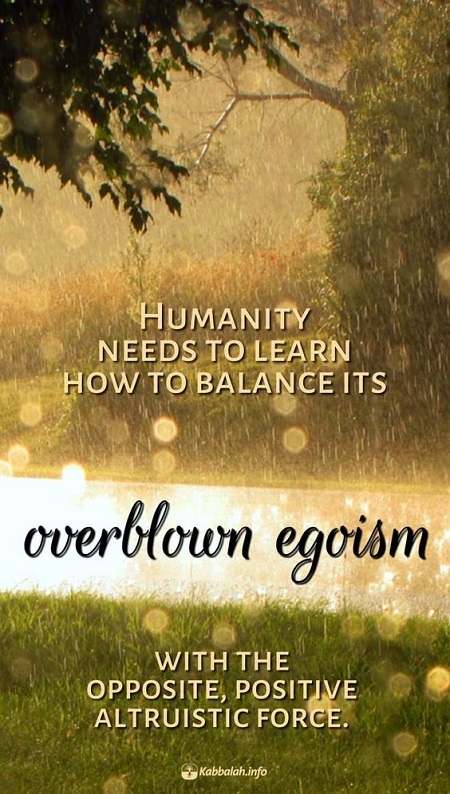 Humanity needs to learn how to balance its overblown egoism with the opposite, positive altruistic force. 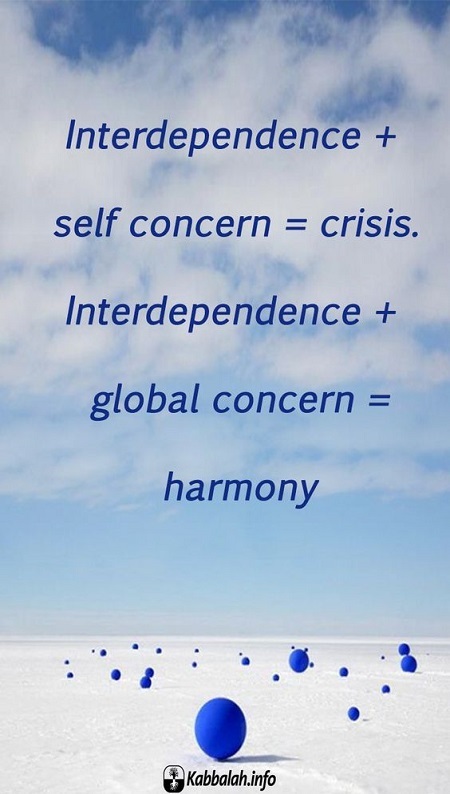 Today, globalization shows us that, on the one hand, we are all connected, and on the other hand, our enormously overblown egoism alienates us from each other. In this state we will acknowledge its pettiness, limited nature, and hopelessness, and come to hate our egoistic nature and develop a desire to unite, to transform our nature into the opposite, altruistic nature. Thus we will independently find a way to transform ourselves into altruists and to reconnect with the entire humanity as a single, united whole.